The 2014 State Geography Bee was held on April 4, 2014, at Longwood University, Farmville, VA. Dr. Robert Morrill, Professor Emeritus at Virginia Tech, served as moderator. 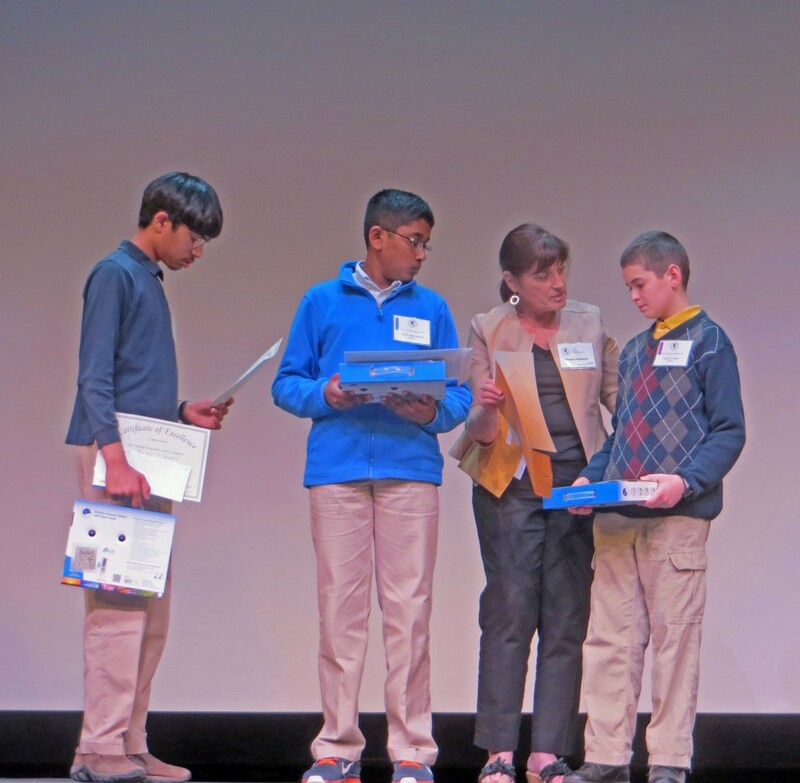 Akhil Rekulapelli from Ashburn’s Stone Hill Middle School, was the winner of the Virginia finals for the second year in a row. 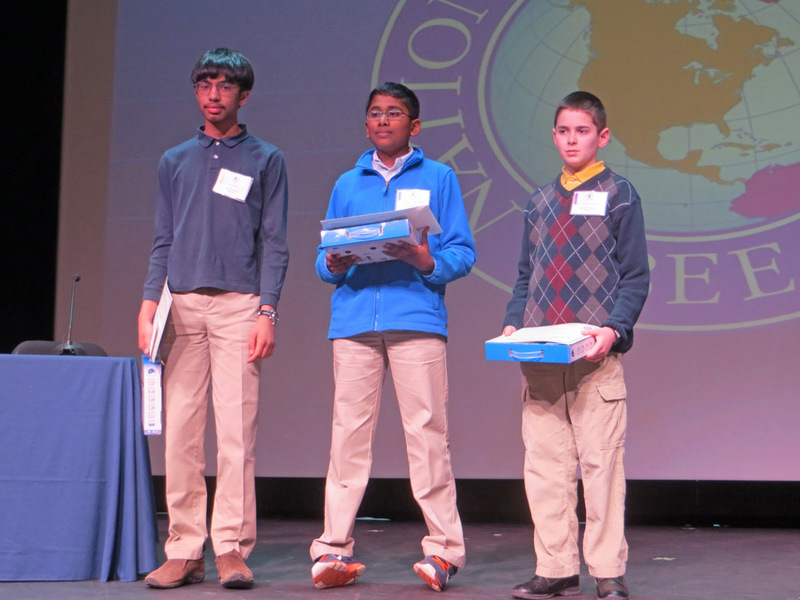 Rahul Gupta from Nysmith School in Herndon was runner-up, and Jacob Augelli of James Robinson Jr. Secondary school in Fairfax placed third. Congratulations to all students who participated in the Bee, winners all. Donna Fontaine (Isle of Wight County Schools), Virginia Bee State Coordinator, presents awards to the top three contestants. 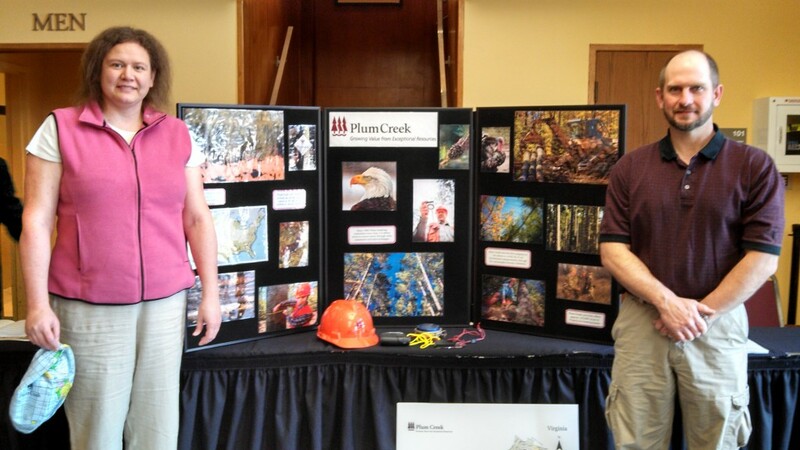 Representatives from Plum Creek with their display in the lobby of Jarman Auditorium, where the Bee was held. 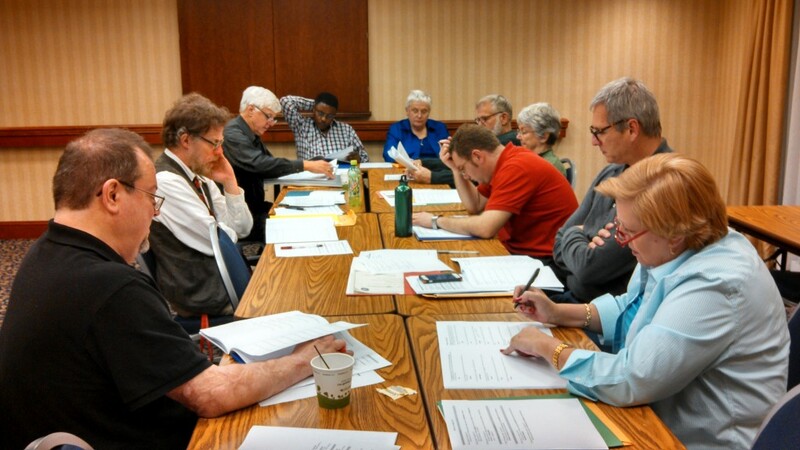 Prior to the Bee, judges and moderators for the preliminary rounds met to review questions. Around the table, from left to right, are David Hardin (Longwood University), Ed Kinman (Longwood University), Bob Morrill (Virginia Tech), Charles Manyara (Radford University), Jean Turrentine (VGA volunteer, Charlottesville), Lawrence McLaughlin (John Tyler Community College), Susan Woodward (Radford University), Luke Juran (Virginia Tech), Brian Rizzo (Mary Washington University), and Sandra Carter (VGA volunteer, Norfolk). Denise Lam (VGA member, Rockingham County), Kim Lawson of Herff Jones|Nystrom and Katie Register of Clean Virginia Waterways and Longwood University volunteered as scorekeepers and timekeepers for the preliminary rounds. VGA members Annie Evans (Charlottesville), Camille Hodges (Clifton), Donna Shifflett (Ruckersville), and Vonda Tabor (Rockingham County) manned the registration desk. Help was also provided by Longwood University students Lester Anderson and Zachary Moore.